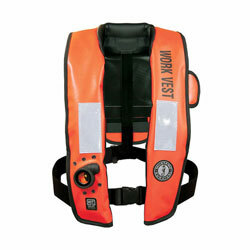 Mustang Inflatable Vests with Hydrostatic Inflator Technology (HIT) offer reliable inflation in a low maintenance design that will only inflate automatically when submerged in 4 or more inches of water, and will not inadvertently due to rain, spray or humidity. This technology is exclusive to Mustang Survival. * Mustang Hydrostatic Inflator Technology (HIT) PFDs are Maintenance-Free for 5 years from the date of manufacture or until the vest is inflated, while standard, water soluble, bobbin style inflators should be replaced every year. Age 16 Years and up and weighing greater than 80 lbs and a chest size of 30" to 52"